For the past 19 years, local businesses have formed teams and enjoyed the opportunity of a lifetime—the chance to play at Fenway Park. 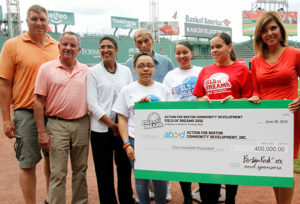 Corporate teams match up on the historic diamond, and support ABCD’s SummerWorks program, which places low income Boston youth in paying jobs while providing them with dedicated mentoring, career readiness and important life skills. kids to work. Field of Dreams is co-chaired by John Sasso and Lew Eisenberg. In 2016, Field of Dreams raised $400,000, making dreams come true for more than one thousand teens and young adults eager anxious to work, learn, and start building a promising future. One full game of softball at Fenway Park. Each team is made up of 22 players, 3 coaches and 1 team manager. Unlimited guest list to Fenway Park for the day. Full-page advertisement in the official Field of Dreams program book. Free ballpark concessions for your team and guests, courtesy of Aramark. Team photos in front of the Green Monster. A variety of off-field activities and entertainment for kids such as; face and tee shirt painting, free baseball card pictures for adults and kids, and a photo booth. In so many ways, the Boston Red Sox are our heroes! The Boston Red Sox organization has demonstrated its steadfast commitment to creating better futures for low-income youth through Field of Dreams, and we couldn’t be more grateful. They’re joined by corporate sponsors Aramark and of course, our corporate teams! Interested in getting involved? We’re signing up teams and sponsors for 2017 now!